If you like Studio Trigger for their animation and plot then Kiznaiver is right for you. Every character has their own personality and lifestyle. And they are connected Painfully for sake of peace. I enjoyed Trigger's previous works and looking forward to watching Kiznaiver. Hope everyone enjoys it. The first 2 episodes were pretty amazing (seen at Anime Boston). There was a lot of information to take in, and a lot of characters were introduced, but overall I very much enjoyed the episodes. I laughed a lot (quite a few characters were very funny) and I am very interested to see how each character develops. It is such an interesting take on an attempt to achieve world peace and I can't wait to see how it plays out. Generally, when I watch anime I am simultaneously on my phone and watching. While watching the first episode I was completely entranced. The art will capture your eyes while the story will entice your mind. I can't wait to watch more episodes in this series. I would definitely recommend it to anyone who wants to watch a beautifully drawn and mind capturing anime. Jaded by the hype train. It's probably because of the massive hype train that I was expecting so much more from this. That and so far this season there really hasn't been a series that has wowed me. The visuals and music were awesome but for me that's about as far as I'll go praising it as of now. I'm hoping it'll change in the future but the story telling and characters were kind of bland. I'm especially hoping that the characters are fleshed out some because I'm so tired of the archetyping and it was so painfully obvious with the introduction of these characters. The worst sin in the first episode is they make a big deal about how... you know, I can't even remember the main character's name. That guy can't feel pain and suddenly he does. Hopefully it carries over into the next episode for if it doesn't I'm done with this. Apparently my reviews have not been the best so far but I hope to convince everyone to at least give this show a shot. Starting off in episode 1 we are introduced to the characters that encompass a wide array of characteristics, all bound together by their wounds. Each character is shrouded in mystery in which I look forward to future development. The animation is great and the music is especially nice. The variety in color gives a unique appeal to the show that reflects a vibrant yet sullen tone. This seems to be a very unique show when it comes to their bond but I do draw some distinctions and similarities with Deadman Wonderland if you like that sort of show. So I saw this pop up in Crunchyroll's background while logging in and thought: hey I need a new show to watch so let's give it a shot. My first reaction was: is this gonna be one of those weird animes? Most of the characters' behaviors lack any sort of depth in the first episode, but after meeting all "7 deadly sins" of high school (lol) I figure they will all undergo some heavy character development eventually which will be interesting to watch. I would recommend giving this a try if you like watching anime about "teens saving the world" without the whole supernatural thing. Kiznaiver is definitely intriguing and has the potential for a lot of character development and plot exposure. After the first episode, this series has some things going for it: Artwork and premise, which could play out into a fantastic and twisted plot. It has other things going against it: Fan-service that adds nothing to a story, and a setup reminiscent of so many other anime lately, where the promise of a nice supernatural plot is there but never gets followed through with and is allowed to grow stagnant. 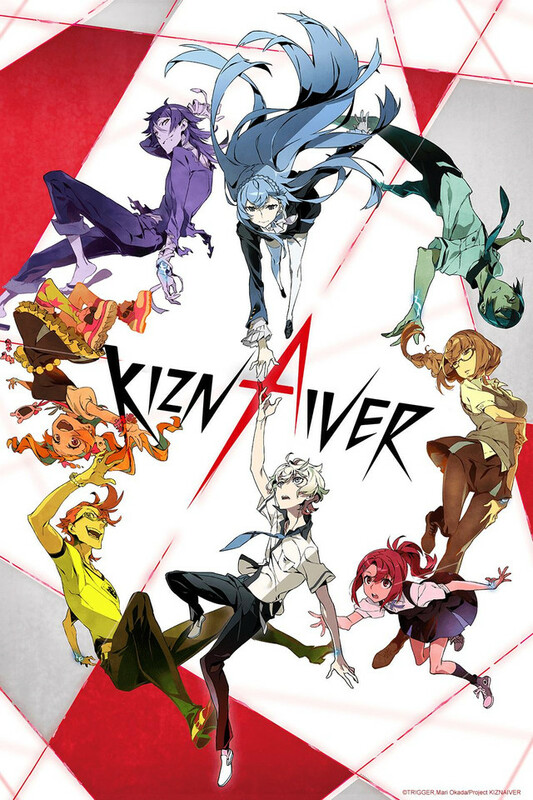 I'm curious to see is Kiznaiver can be that series that breaks that recent anime style and makes itself into something really worth watching. First of all i'm a huge fan of TRIGGER. I love Gurren, i adore Kill La Kill and i honestly think that Little Witch Academia is one of the most amazing pieces of animation that came out of japan in the last decade. That said, there's not ANYONE that deserves a "free pass" because of they previous works. The first episode of Kiznaiver is really really bad. The pace is terrible, the script is pretensious but never deliver and basically nothing happens. It does have potention and i will keep watching but for now, that's a real failure. For the first episode it gets into the thick of things fast, almost too fast for my liking and it's really easy to write it off as some 'mumbo jumbo' pretentious storytelling nonsense, because that's what it sounds like in this first episode. We're giving a lot of information with practically no foundation except 'it's just how it is'. I'm expecting a lot better exposition in later episodes or this is gonna sink fast. Great animation and music as always from TRIGGER, but it's gonna take more to float this show.